I have a GoFlex Home that won't boot. I've connected it to a terminal via a USB to UART, but I can't get any output from the device. The GoFlex however, just keeps blinking the green light forever, with no output to the serial console. I think my GoFlex is bricked. Neither of these gave me any output and when I rebooted it just got stuck on the infinite blinking green light. Is my GoFlex actually bricked? > I can't get any output from the device. That's a good first step. You need to know that your serial console works before trying to unbrick this. > console. I think my GoFlex is bricked. When it is blinking, the box might be OK. So I would try to verify that CP2102 works again. Try loop back the TX and RX to see what you type appear on you serial console terminal. Those were unlikely the problem. > Is my GoFlex actually bricked? I don't think it is bricked beyond recovery. The example in the link post above was for the Zyxel NSA310S. But it is applicable to the GoFlex Home just the same using a different u-boot image. Use the instruction to kwboot your Goflex Home. See if you can do that and we'll continue from there. Okay, obtained the kwb and set up kwboot. I put in the kwboot command and it says "Please reboot the target into UART boot mode". How do I do that? I've tried executing the command when the GoFlex is off, on and in recovery. Neither of them work. Also, correction: serial console doesn't show the Tx or Rx indicator as active. (Previously, the metal plate below the GoFlex board was causing both Tx and Rx to light up simultaneously.) Now just Ground lights up. >"Please reboot the target into UART boot mode". Unplug power, start kwboot, and then power on the unit. Should I just ignore this and assume all Kirkwood related content works with this device? Could using Kirkwood based firmware make things worse? It is a Kirkwood. Either this stock u-boot has been replaced by somebody, or this is some newer version of stock that I vaguely remember seeing somewhere (but not sure). > related content works with this device? > Could using Kirkwood based firmware make things worse? I'd doubt it will make it worse, it should make it better. But use your own judgement here :) as long as you can kwboot the box with my new u-boot, you are quite safe. Don't flash it yet until you have confidence that it is running OK. You can boot Debian on USB/HDD drive by booting with kwboot. Does this have anything to do with the GoFlex not being able to accept input? I can see U-boot outputting it’s banners and all, but I can’t send commands to the device. I assume it’s either the “Write allocate disabled” message during boot or the burnt PCB hole. > being able to accept input? > all, but I can’t send commands to the device. I can’t give any user input so I can’t interrupt the boot. I’m not sure if it’s due to a software side issue or the burnt PCB connector. Right there: "Write allocate disabled". Does that have anything to do with this? No, it is normal to see this output from stock u-boot. Of course, it is impossible to send command to the GF Home if you don't connect its RXD pin. From the pic you posted above, only GND and TX are connected. If that RX pin was burnt out and cannot be used, then you cannot boot with kwboot. You will need to boot stock u-boot into stock OS or new Debian rootfs, and then flash new u-boot from there. That's what you should do, because with new u-boot you can gain back most input control to the boot process by using netconsole and uEnv.txt. Trouble is finding out what such a connector looks like or what it is called. Like I said, a bit of excessive solder or a dab of hot glue on the tips should help hold it in place. I've tried it and works like a charm. > like or what it is called. I don't know the diameter of the pins (or holes) and the spacing between them, or type of connector. but it's like looking for a needle in a haystack. After rummaging about in my old computer cables drawer I found some old cables which happened to have 5x2 connectors which fitted perfectly and created a much more solid connection. Edited 1 time(s). Last edit at 06/09/2018 11:20AM by balanga. These connectors are called JST 2.0. The smaller one is called micro JST. I would recommend you guys read the post and section that I posted above. There are more than enough information in there, no need to search anywhere. Also, on the GoFlex Home, if it has the header preistalled (some GFHomes have) you don't need to find the 10 pin header cable, use the CD Audio Blaster cable to connect would be fine. 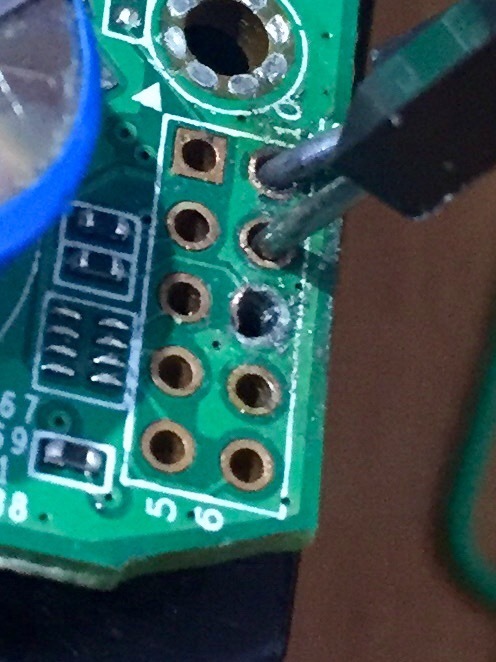 If your GF Home has only solder holes, then you need to solder the JST header in. If you don't like soldering, then just use 3 male-female test wires (male to the board holes, female to the Serial Module CP2xxx). Edited 2 time(s). Last edit at 06/09/2018 04:02PM by bodhi. > then you cannot boot with kwboot. Okay, I've managed to fix the burnt out Rx port with a bit of soldering. Ive tested this by interrupting boot on my stock firmware. its just an endless "Please reboot the target into UART boot mode..."
>Unplug power, start kwboot, and then power on the unit. kwboot doesn't do anything when I do this. Am I doing it wrong? > > then you cannot boot with kwboot. > interrupting boot on my stock firmware. At this point you can run some commands such as printenv at stock u-boot prompt? I'm not sure what you meant here. Is the message above repeated endlessly, or nothing happened? Please post the log of your kwboot attempt here (copy/paste the entire terminal session). > (copy/paste the entire terminal session). > I'm not sure what you meant here. Is the message above repeated endlessly, or nothing happened? > Unplug power, start kwboot, and then power on the unit. Edited 1 time(s). Last edit at 07/06/2018 03:32AM by shayan123. > > > GF Home if you don't connect its RXD pin. > > > then you cannot boot with kwboot. > > interrupting boot on my stock firmware. printenv at stock u-boot prompt? > printenv at stock u-boot prompt? <Explorer> Enter USB firmware instllation by RESET IO. <Explorer> Please power off system retry again! Also, I have no idea what Error code 3 means. Your envs were corrupted for whatever reason. So you cannot boot to stock OS or any OS. That CRC error means the NAND space (usually 128K) that contains the envs were wiped out, or messed up. You have only used this box as stock, and never install Debian or Arch on this box? > BTW, my envs look like this: (See attachment). 1. If you want to keep running stok OS. Find somewhere that has the list of the GoFlex Home stock envs and reapply them in serial console at u-boot prompt. And then save them. After that the envs are restored. 2. If you want to run Debian on USB or HDD, try to boot into Debian using a USB drive. This will be a ittle more works, as you have to set the new envs to do that. Let me know which way you prefer and I might be able find the envs for you. Or someone could. For choice 1, I don't have this FW version (my GFH boxes are much older so what I have in my old notes might not work). The main reason I started tinkering with my GFH was because I wanted CUPS on it. So I suppose Debian is a better choice. I'm not sure how to proceed (considering that my envs are currently messed up). If I decide to install Debian, do I need to fix the envs first? Also, is it possible to run CUPS and avahi on stock firmware? Goflex home is a good general purpose NAS for home. Edited 1 time(s). Last edit at 07/11/2018 06:29PM by daviddyer. > Debian is a better choice. > envs are currently messed up). No need to fix them. But you need a few new envs to boot Debian on USB. Dont know. It’s been too long ago I can’t remember. After you’ve done with rootfs, I will be back to show you which envs you need. > show you which envs you need. Okay, I have the tarball on a FAT32 (MBR) formatted USB. I assume I can't access the /boot unless I correct my envs? Follow the instruction to create this rootfs on USB. The guide here describes how to install Debian over SSH but currently, I can't get SSH to work. I think I need to fix my envs before attempting to install Debian. > notes might not work). I wouldn't mind giving these a try. I don't suppose the envs could be that different.